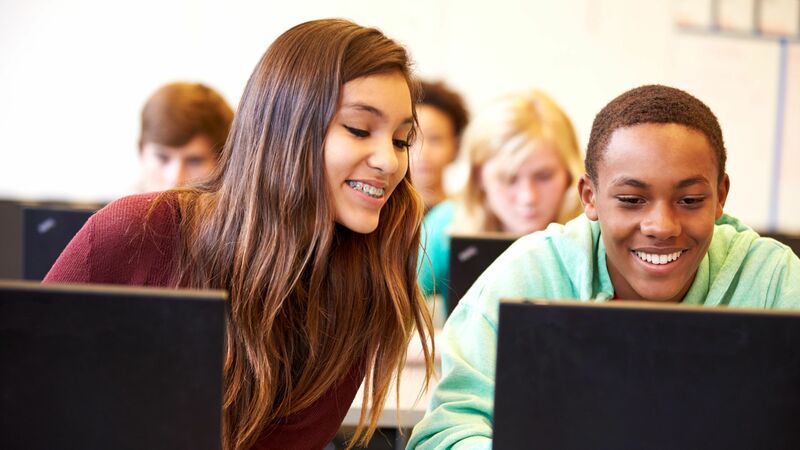 Online quiz programs weren’t designed for world language classes, so we have five tips for keeping students focused on the target language. The advent of interactive play platforms such as Quizlet Live, Quizizz, Kahoot!, and Quizalize has brought to world language classrooms an engaging way to review vocabulary. Students enjoy the low-stakes competition, the fast pace of the games, and the interaction with their peers. For teachers, these platforms provide a seamless way to get all students excited and engaged. However, they were not developed with the world language classroom exclusively in mind and therefore present a few challenges. The act of breaking into small groups and the simplicity of the games may remove students from the mindset of using the target language meaningfully. So it’s important for the teacher to add some structure when using these games. Here are some ideas for using these game platforms in your classroom while still promoting language acquisition. 1. Make play relevant. If you want students to take play seriously, don’t use it as a disposable part of your time together. Students won’t be invested if they see these games as time fillers devoid of learning goals. Before each game, make sure you explain why the class is playing. In the first lessons of a unit, I use these games to review vocabulary after introducing it. Later on in the unit, I use them at the beginning of class in order to mobilize students’ lexical knowledge before moving on to more cognitively demanding tasks. Additionally, on the first day back after a few days off, these games are helpful to ease students into speaking in the target language. Even if students may seem to care only about playing and winning, they’re also developing their communication skills. Make sure they know that you place learning value on these activities. 2. Encourage students to help each other in the target language. Everyone likes winning, but in these platforms it’s impossible to do so by oneself—they require a team effort. This opens up a great avenue to facilitate real social interactions. During games, I demand that students speak in the target language all along. Since they want to play and win, they have a strong motivation to learn how to say such things as “I don’t have it,” “I have it,” “I’m finished,” “Hurry up,” and “Great!” Even if you haven’t formally taught the past tense, the imperative, or object pronouns, students manage to use these expressions correctly. Having a student say “J’ai fini” or “Je l’ai” (“I’m done,” “I got it”) in a situation in which she’s thinking more about winning than target language grammar is always a triumph. Don’t speak anything but the target language. Select and say all the words in the target language. As students become familiar with the rules, I ask them to tell me the rules in the target language. After a few weeks, I ask students to write them on the board themselves. You can phrase rules in a way that provides repeated exposure to structures and vocabulary students will study at some point in the course (“ne... que” negations, and affirmative and negative commands, in this case). From a procedural standpoint, remember that clear routines reduce uncertainty and distractions. 4. Read the code numbers in the target language. Students must enter an alphanumeric code to gain access to these games, so I usually hide the code and read it to them in the target language, rather than allowing them to see it on the screen. This gives them a chance to exercise listening skills and stay in a target language mindset. At the same time, students use numbers in context and draw on their math background knowledge in the target language. Depending on the level, I break up the code in different ways: I start with one or two digits at a time for beginners, and use longer strings as students advance. Students have enjoyed the challenge of listening to and saying four-, five-, and six-digit numbers. In order to promote engagement, you can reward those students who enter the code first. I don’t mind repeating the code many times, provided that students ask appropriately in the target language. I’ve also involved students in setting up the game by designating one of them to be the code reader. For many, listening to the code is an exciting way to start playing. I’ve seen students pumping a fist in the air after getting the code right at the first attempt. 5. Make it a rule to say the words they select out loud. In order to add an oral dimension to the game, I make it a rule that students say out loud the words they select. Since the task becomes a bit more complex, the likelihood of vocabulary acquisition increases. For me, this is a great way to monitor pronunciation in a low-stakes context. I often model correct pronunciation between games.